Letters to Elijah: Matthew West CD giveaway! 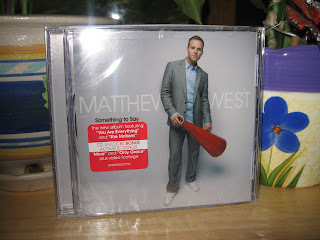 I love Matthew West's music! He has a fresh contemporary Christian style. Give it a listen! A little while ago I won his cd from a local radio station. I've never won anything before so I was really excited. All you have to do is leave a comment below to be included in the draw. I will draw on Friday, October 10th at 8:30am Good Luck! I've never heard him before, but I'll give it a listen. I'm excited to be part of a giveaway!!! I forgot to let you know that I received the CD and I love it! Thank you again!